February 24, 2010  Officials from Anthem Blue Cross of California explained the company's decision to increase health care premiums to a House Energy and Commerce subcommittee. The hearing takes place a day before President Obama hosts a bipartisan summit aimed at reviving the long-stalled health care bills. February 23, 2010  Five Republican Senators joined Democrats to push a bipartisan jobs bill past a GOP filibuster, and on to a final vote Wednesday. It's a much-needed victory for President Obama — even though the measure is seen as giving only a modest boost on hiring. The Senate's newest Republican, Scott Brown of Massachusetts, was among those breaking ranks. February 22, 2010  Since Senate Democrats no longer have the 60 votes they need to avert GOP filibusters, some say it's time to revamp the rules on filibusters. Otherwise, they say, legislation and nominations will remain mired in partisan gridlock. Even moderate Republicans no longer seem inclined to provide that 60th vote. Is there any politically plausible remedy to this impasse? February 12, 2010  The Senate's traditional approach to a president's nominees has been to advise and consent. But with Senate Republicans lately, it's been more like chastise and dissent. The seating of Sen. Scott Brown cost Democrats their filibuster-proof majority. GOP senators are wielding their new clout to block President Obama's picks. February 11, 2010  Senate Democrats rolled out their latest proposal for creating more jobs on Thursday. Several leading Republicans have endorsed measures in the bill, so for now at least, it's being called bipartisan. But there are already doubts about its prospects. February 10, 2010  Federal government offices in Washington are closed for the third straight day because of bad weather. But the deep snow did not stop the U.S. Senate from trying to do business Tuesday. Still, the day's events showed that for lawmakers, getting to work in a nearly paralyzed city is one thing; digging themselves out of entrenched partisanship is quite another. February 4, 2010  Republican Scott Brown was sworn in Thursday as the 41st Republican in the U.S. Senate. His election ends the Democratic supermajority in the chamber. Don't Ask, Don't Tell Policy's Days Numbered? February 3, 2010  Seventeen years after its passage in Congress, the military's Don't Ask, Don't Tell policy's days may be numbered. Last week President Obama told Congress he wants to work with lawmakers and the military this year to end that policy, which has led to the expulsion from the armed forces of more than thirteen-thousand gay and lesbian servicemembers. Defense Secretary Robert Gates announced plans Tuesday for a yearlong study of how a repeal of Don't Ask, Don't Tell might affect the military. And a key Senate panel had its first hearing on such a repeal. January 28, 2010  A look at Obama's claim that he has "excluded lobbyists from policy-making jobs or seats on federal boards and commissions." January 28, 2010  President Obama made a stab at fostering more political harmony in his speech, but he also had some warnings. January 26, 2010  On Tuesday, the Congressional Budget Office put a number on this year's deficit: a little more than $1.35 trillion. President Obama and Congress agree that something should be done. But a proposed bipartisan commission to tackle the deficit was shot down in the Senate. January 25, 2010  The timing this week of a Senate vote on a second term for Fed Chairman Ben Bernanke is proving problematic for President Obama. Bernanke's term at the helm of the central bank expires Sunday, and though Obama has endorsed a second term, some Senate Democrats are balking. 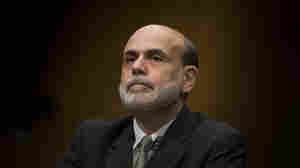 Bernanke's fate could now be up to Republicans.